Playing today in the "rock room" in an excellent stereo audience field recording from Chicago, Il on January 4th, 1974, the second show from the legendary Bob Dylan and the Band arena tour. This concert finds the group settling into the set format that would develop the framework for the rest of the tour. This change follows a unique song list and different concert order from the first evening in Chicago. What is appealing about this performance is that it contains a loose intensity and focus that slowly changed into forced excitement and redundancy once the shows started to be recorded for the live album. At this point Bob and the Band are enthusiastic and still developing their chemistry for the upcoming run of shows. The performance is fiery and homegrown highlighted by the stellar sounding field recording. For fans of the "Before the Flood" release and/or 1974 era Dylan and the Band, this show presents a multitude of surprises and standout performances. The recording starts with a "Hero Blues" in progress, but finds the group in a full on funky swing. Danko's humming tuba bass, and Robertson's screaming Stratocaster coming through lour and clear on the tape. Helm, who missed out on many of the early Dylan and the Hawk's shows, contributes his unique country swing to Dylan's originals by hitting tasty and original double stops and rattling ride cymbal dances. "Hero Blues" its self is a unique opener being unreleased at the time, and only being played at the two Chicago concerts, this being its final performance ever. The song is an obvious commentary by Dylan on the reaction of media and fans to the 1974 tour. The tune is a stellar opener and an immediate highlight of the recording. Following "Hero Blues" comes a floating and slightly out of tune "Lay Lady Lay" that seductively rolls, picking up momentum and intensity. Garth Hudson's lacy Lowery organ work drapes over the song adding a ghostly quality to the performance. Dylan's vocals are clean and on target with the "shouting" of later performances missing. The crowd loves the song choice, but is not intrusive with their approval. "Just Like Tom Thumb's Blues" follows, and opens on a Dylan strum and Danko bass run. "Tom Thumb" contains beautiful Flamingo tinged response guitar runs by Robertson that echo all of Dylan's verses. Unlike the explosive 1966 versions this performance moves at its own pace, taking off when Robertson mows down the assembled crowd with electric guitar scatter shot. Manuel's piano is now audible on the recoding delicately laying down the foundation of the track. Garth puffs up his chest with colorful swells that breath life into the aural water color. The group has now caught fire and is "locked in tight and out of range". The momentum does not dissipate as Dylan and the Band prepare for the following tune. "It Aint Me Babe"struts with a dirt road skip in its step. This version is a much more tender reading than those later in the tour. Danko adds his perfect Appalachian harmony to the chorus joining Dylan. Levon's "rat-a-tat" drum beat pushes the groove in a unique way, like a rubber ball on a trampoline. A version that brings to mind a day of fishing at a quiet country pond as opposed to on a thrashing speed boat screaming over waves which later versions played on the tour would elicit. "Tough Mama" trickles in on the back of Dylan's rhythm guitar and develops into rock solid and bawdy version with all band members on deck. Dylan is in fine throat and despite a vocal miscue spits out the lyrics with attitude. "Tough Mama" is another song that would disappear from the set list after the Chicago and Philadelphia performances, for reasons unknown. This version is particularly good, rolling on the circular honky-tonk Robertson guitar figure and slippery Danko bass riffs. In their own unique fashion Hudson and Manuel's organ and piano mesh like a circus band, with both becoming more audible on the tape. The end of the song is signaled by some great but distant Dylan harp blasts. A "Planet Waves" favorite of the rock room and a great live rendition. The conclusion of the first segment of the show is reached with a slow percolating "Ballad of a Thin Man". Brimming with Hudson's hide and seek Lowery organ producing spooky swells, and Dylan's aggressive piano pounding along,this version, like the 1966 versions is a early highlight. Special mention to Dylan's dynamic changing tempo vocals, and Robertson's wobbly tremolo string bends. Dylan's voice is in fine form for these early performance, and this version is a fitting example. Signaling that first segment of the show is finished, The Band begin their part of the show. 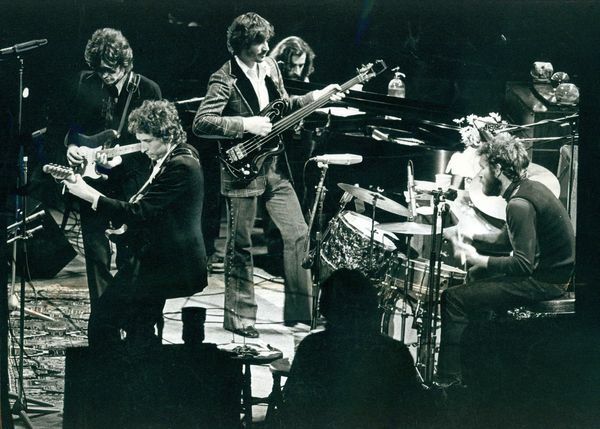 Dylan leaves the stage and lets The Band do their thing. "Stage Fright" begins the set and is a fine version, containing the usually fantastic Danko lead vocals, and Garth Hudson's orchestrated and virtuosic solo spots. The Band's sets would not vary after the first few shows of the tour. This prospect is both a positive and a negative. The positive is that the sets become tight, well timed, and by February have exploded into powerful concise statements; the negative is that they also became somewhat stale, and lacked new information for the assembled crowds. Regardless, this set from early in the tour hits the spot and contains a surprise or two. Solid versions of "The Night They Drove Old Dixie Down", "King Harvest" precede the distinct and rare version of "Long Black Veil" which would not be played again after three shows. Garth's sacrosanct organ lends a serious emotion to the reading of the classic song. Danko and Helm sing together like high and lonesome brothers, as the group keeps a slow and steady swing. The Band's set closes with a stirring version of "I Shall Be Released", and crowd pleasing "Up On Cripple Creek". The "I Shall Be Released" features Manuel's usual falsetto reading, and he sings it with his expected heart and soul. Dylan now returns, with the Band remaining on stage for another segment of electric music. "All Along the Watchtower" comes roaring out the gates with the fierceness of Hendrix's version, but made more relevant being performed for one of the first times by its original author. Robertson plays sustained "thin wild mercury" notes, silvery in their statements as The Band scans the horizon from the watchtower's lofty heights. The recording sounds so sweet and for brief moments I can put myself there through the magic of magnetic tape. Keeping the excitement tapped into the red Dylan pulls out a "Leopard Skin Pill Box Hat" from the closet's top shelf. A definite peak of the performance, "Pill Box" plays on the strengths and history felt by the entire group. Manuel and Hudson wind up tight like a tangled spool of yarn, Dylan blows gusty harp, and Robertson pulls out all sorts of distorted chunks, screeching bends, and warbles from his Strat. Under it all, the rhythm section of Danko and Helm drive the group, a pair sped up trucker following an all night white line. Bringing down the momentum a bit the group plays a first time singalong version of "Knocking on Heavens Door" with Dylan really putting himself into the performance, which also contains some different lyrics. This is also a top version with the entire group invested in each and every detail. For a debut version it is a confident and emotive performance. This track sets the stage for the five song acoustic set which Dylan will return for after a brief break. This acoustic set spotlights delicate harp playing, a respectful crowd, and a Dylan who is carefully expressing each beautiful line. I can really feel the crowd grasping onto each lyric for dear life. The oft played "Times They Are A Changing" begins the set, followed by my personal favorite, "Love Minus Zero/No Limit". Almost whispered by Dylan, "Love Minus Zero" and its compelling melody bring the crowd to its collective knees. This version is an evening breeze comprised of breath, space, whispers, and slivered harp. Following close on its heels, is a dramatic "The Lonesome Death of Hattie Carrol" which Dylan sings magnificently. The tempo Dylan directs is addictive and balances the song on the natural beat of his voice. His harmonica solo is fantastic and exists in its own space and time as Dylan's breath acts as a ghost metronome for his silver guitar strokes. Amazing. The new song featured in the acoustic set is the striding "Nobody Cept You" from "Planet Waves", which like other songs from the LP would eventually disappear from the concerts after the first few shows. Listening to this version I have to wonder why? Dylan is very interested vocally in this version, as I can tell that his new music excites him. Was it the crowd responses that caused the disappearance of Planet Waves tracks from the set? Whatever the cause, "Nobody Cept You" is a fine performance and quite possibly the peak of the acoustic set. Closing Bob's solo spot is "It's Alright Ma" (I'm Only Bleeding) which I can say is a great version, but pails compared to some of the later tour versions. Obviously one of Dylan's greatest compositions and a song that draws amazing feedback from the crowd, any version is going to be worthwile. Following Dylan's acoustic interlude, The Band returns for another electric solo spot. The group really punched the time clock on this tour, putting in plenty of overtime. This spot features exciting versions of their "greatest hits" "Rag Mama Rag", "The Shape I'm In", and "The Weight". Special mention goes to the rare "When You Awake" which would feature in many of the shows in the first quarter of the tour then disappear form the set. This version of one of The Band's most beloved songs is sung endearingly by Danko, and features sympathetic instrumentation by the boys, and spotlights their recognizable overlapping vocals. A lofty and misty summit of the show for me. The spirit of The Band shines true through this special performance. Dylan then returns again to the stage yet again for more electric tunes and a expansive panoramic version of "Forever Young". Performed like someone reading a private love letter by candlelight this is a delicate performance. Dylan's harp, Hudson's organ, and Robertson's guitar blend together like pastel watercolors on a pallet during the solo spot taking the song to new emotional heights. Highlight. Another "Planet Waves" track follows, with the entire group joining in on "Something There Is About You", a tune that would also be played for about half the tour before being retired. In spite of one or two muffed notes the song builds to a grand peak with Dylan sharply shooting out the verses and dolling out some more harp. Hudson's organ colors the track rising like a fresh musical ball of dough. The set closes with the expected "Like a Rolling Stone" which in my opinion is a energetic well played version, but pails in comparison to the explosive 1966 performances when the guys really played it like they meant it. After the excited and appreciative crowd urges them back out to the stage, the Band regroups to blast out the rarely played and newly syncopated "Maggie's Farm". Dylan rips into this one with show ending abandon, with the group chasing him down from behind. The new arrangement serves the group well, and enables The Band to make the song their own. Percussive piano, wavy organ, mixed with some southern swamp drumming by Helm take this one to the next level. During the mid song solo Danko and Robertson turn up and mix up the medicine, bringing the song to a proper show closing conclusion. 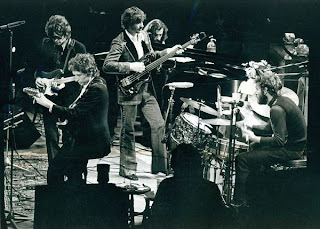 The 1974 Bob Dylan and The Band tour contained 40 dates across the US and Canada with many shows being recorded for the eventual live album "Before the Flood". 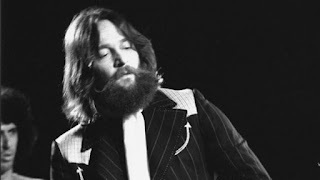 Reviews for the shows were mixed; with the fans being blown away, while some of the musicians and critics feeling the performances were "forced". The early dates of the tour like the aforementioned, I believe contain undeniably fantastic and well played concerts. I can concur that some of the later recorded dates have a preconceived aggressiveness and a "play for the tape machine" vibe. This could be because of many reasons drugs, pressure, management or all of the above. Regardless, these early shows feature a looseness and rough energy that is a pleasure to listen to, especially when captured by a sonically pleasing field recording. There are many other shows on the tour which contain these same qualities such as the Toronto performance on January 10th and the two Boston shows. The 1974 tour is legendary and regardless of opinion and conjecture is a high point for all the musicians involved. If you are a fan of Dylan and/or the Band and have not explored this tour I recommend starting with the early shows, then move into the slick and polished February performances. If you are not familiar with the shows at all, begin with the official release, "Before the Flood" and then dig into the field recordings for a more detailed and all encompassing view.